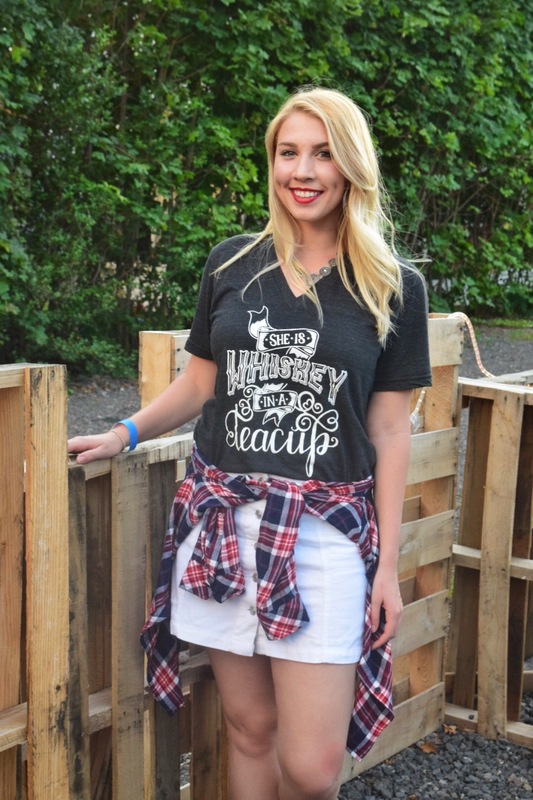 When it comes to my wardrobe, there are few things I love more than a really great graphic tee and lucky for me (not so lucky for my wallet), graphic tees are a major trend right now. The reason I love these shirts so much is that not only can they add a little fun to a normally simple (read: boring) outfit but they also let you show off your personality in a way that other accessories and details can’t. One of my favorite stores to get graphic tees is The Blue Envelope (check out previous post here). They carry so many amazing shirts for adults and kids alike. And if you’re ever in a stitch for a gift for someone, their tees make the best presents especially if that someone is a mom, teacher or nurse. Here, I styled The Blue Envelope’s “Whiskey in a Teacup” shirt with a white denim skirt, a silver statement necklace and silver hoop earrings. As much as I love to wear tons of color, outfits like these make great transitional looks as we move into fall. Tie a plaid shirt around your waist which not only looks cute but is handy for when it gets chillier at night or the mosquitoes start to bite! On top of that, once the weather starts to cool down, you can easily swap out flip flops and flats for your favorite pair of booties. Opt for a bright pink lipstick in the summer and red and plum colors in the fall. Here, I’m wearing my new lipstick from Urban Decay’s “Vice” collection. Y’all, I am obsessed. Not only is it super creamy but it survived a night of eating and drinking without relocating to my teeth or smearing across my face. I’d call that a win-win. The color I have on is a deep red called “Bad Blood” (cue Taylor Swift song) which has a “comfort matte” finish. Overall, I would highly recommend and I will be forever avoiding Ulta and Sephora so I don’t “accidentally” buy the other 99 colors. Fall is easily my favorite time of the year and I am SO ready to trade my shorts and tanks out for jeans and sweaters. Until then, outfits like these will be a staple.